What might happen if the age that individuals can access their superannuation (the 'preservation age') were raised? Is the way people draw down their superannuation, and in particular, the use of lump sums, problematic? As part of its research for this paper, the Commission has developed a model - referred to as the Productivity Commission Retirement Model (PCRM) - to assess the effects of increasing the preservation age. Modelling supplementary papers are available from the tab below. Australia's ageing population will increase demands on the retirement income system. With this in mind, this report seeks to improve understanding of two elements of the retirement income puzzle - when and how individuals access their superannuation. The preservation age - the age at which people can access their superannuation savings - is considered by some to be an important policy lever in managing the transition to an older Australia. The Commission has found that, consistent with expectations, raising the preservation age encourages some people to work longer and accumulate more superannuation. changing the preservation age will have little, if any, impact on the workforce participation of individuals who retire involuntarily - almost one half of men and over one third of women who retire between the ages of 60 and 64. 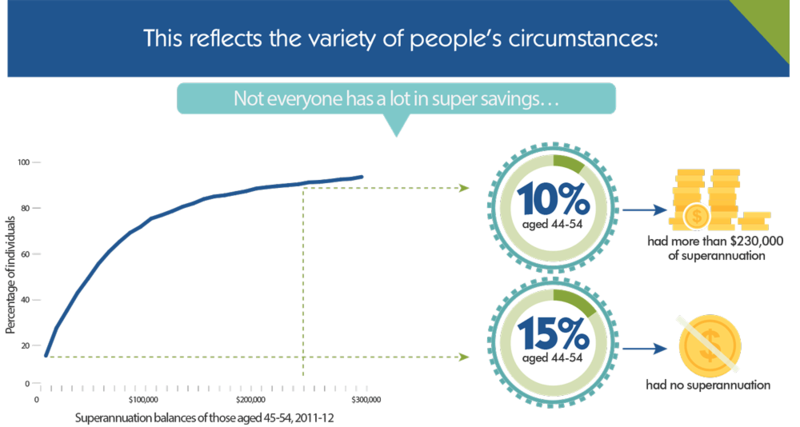 Once they have access to their superannuation savings, individuals are afforded much flexibility in drawing them down. Some consider that this discretion is desirable given the diverse circumstances of retirees. Others are concerned that it encourages individuals to exhaust their superannuation too quickly by taking lump sums and leads to more reliance on the Age Pension. The evidence suggests that most retirees are prudent in their drawdown behaviour. Less than 30 per cent of superannuation benefits are taken as lump sums. When retirees do take lump sums, they are most frequently used to pay down debt, invest in income stream products, and purchase durable goods that are used throughout retirement. 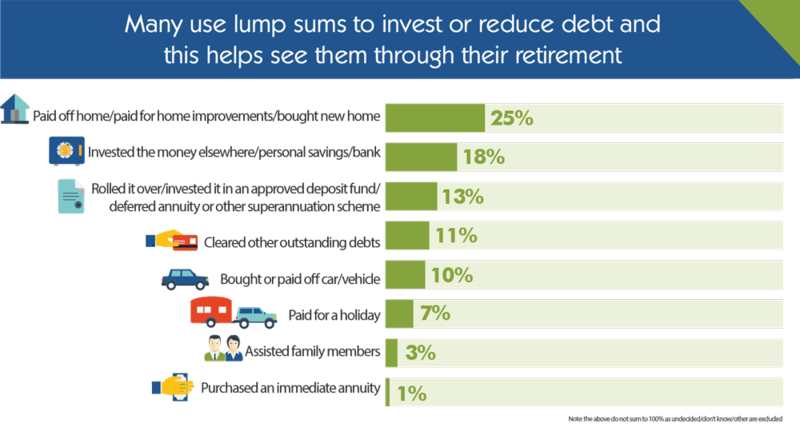 Lump sum use is not uniform, and is most prevalent among those with low superannuation balances (less than $10 000). These households tend to take between half and all of their superannuation assets as a lump sum. The evidence suggests that this behaviour has little impact on Age Pension reliance. how to best manage longevity risk given the demographic transition underway. The retirement income system has seen ongoing change to its components, albeit with less focus on the drawdown phase. But its overarching objectives remain poorly defined. Ideally, future changes to the system would be guided by a common set of objectives, informed by the principles of sustainability and efficacy, and considered as part of a holistic review involving considered and extensive community consultation. Today the Productivity Commission released its research paper Superannuation Policy for Post-Retirement. The report is a policy research sequel to the Commission's 2013 flagship research project An Ageing Australia: Preparing for the Future. 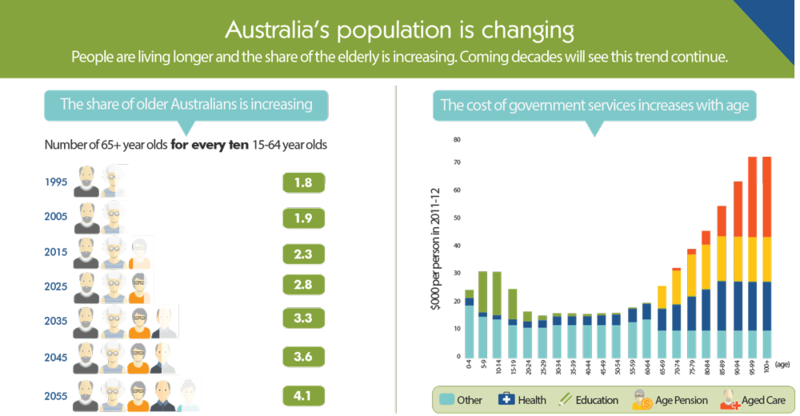 Australia's ageing population has important implications for the retirement income system. This research report considers two important aspects of retirement behaviour — when and how people access their superannuation. changing the preservation age will have little, if any impact, on the many older Australians who retire involuntarily. Currently, almost one half of men and around one third of women who retire between the ages of 60 and 64 do so involuntarily. While the report has assessed the likely impacts of raising the preservation age, important implementation issues would need to be considered and resolved before any changes are made. For example, an appropriate safety net for those who become involuntarily retired would be a priority. The report also finds that most retirees are prudent in the way they draw down their superannuation. While the use of lump sums attracts much attention, the report finds that their use is not problematic. Less than 30 per cent of superannuation benefits are taken as lump sums, with most superannuation benefits taken as income streams. Where lump sums are taken, they are most frequently used to pay down debt, invest in income stream products, and purchase durable goods that are used throughout retirement. The report finds that changes to the retirement income system need to cater for the diverse circumstances of retirees, where 'one size' does not fit all. 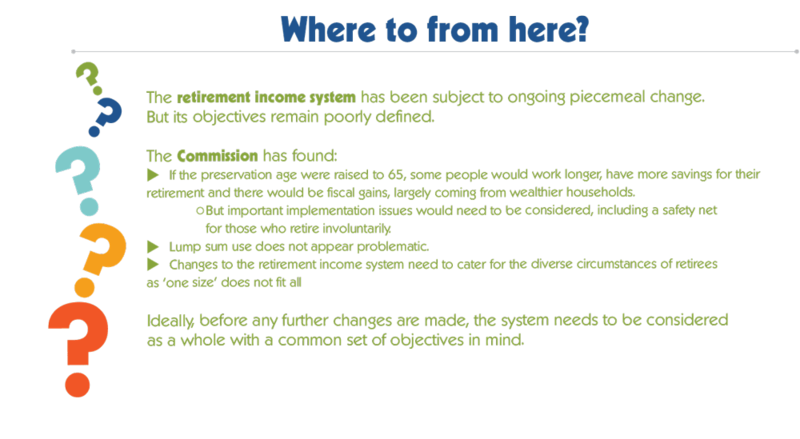 In undertaking its analysis, the Commission identified a number of features of the retirement income system that warrant more detailed and collective analysis, and considers that there would be merit in a holistic review of retirement incomes policy, informed by considered and extensive community consultation. As a research project, the report makes no recommendations but its analysis and conclusions may be of relevance for future policy development. The Commission has also initiated a follow on policy research project examining the housing decisions of older Australians. Cover, Copyright and publication detail, Foreword, Contents, Acknowledgments and Abbreviations and expanations. 2.1 How do individuals save for retirement? 2.2 How does the Age Pension support retirement incomes? 3.1 What influences the retirement decisions of mature age workers? 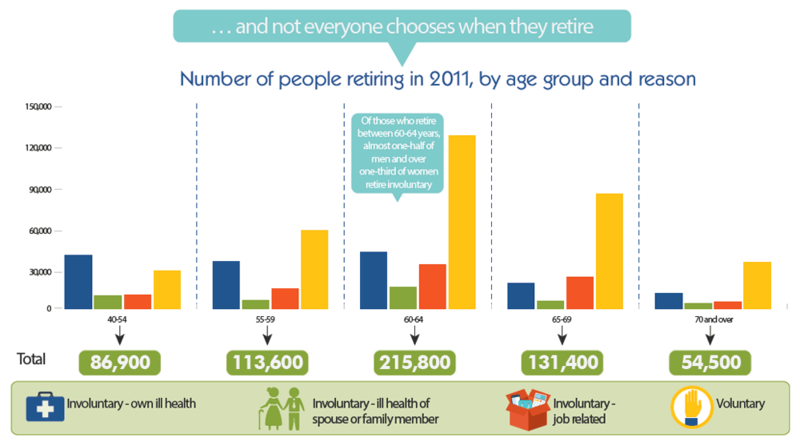 3.2 How is retirement behaviour changing? 3.3 Will further increasing the preservation age impact retirement decisions? 3.4 Where to from here? Chapter 4 Is drawdown behaviour a concern? 4.1 What do people say about lump sums? 4.2 How is superannuation being drawn down? 4.3 How are lump sums being used? 4.4 Do lump sums encourage premature access to the Age Pension? 4.5 How might drawdown behaviour change as the system matures? 4.6 Are income streams working well for retirees? 2.3 How have savings changed and how will they change in the future? 4.1 What is financial literacy and how can it be measured? 4.2 Why is there a lack of financial literacy when it comes to superannuation? 4.3 What measures are there to improve financial literacy? 4.4 Should more be done to improve financial literacy when it comes to superannuation and retirement? 5.1 What drives the labour force participation decisions of older workers? 5.2 How common is involuntary retirement? 5.3 What are the characteristics of the involuntarily retired? 5.4 What is happening to rates of involuntary retirement over time? 7.1 Why are robust data important? 7.2 What are the drawbacks of drawdown data? 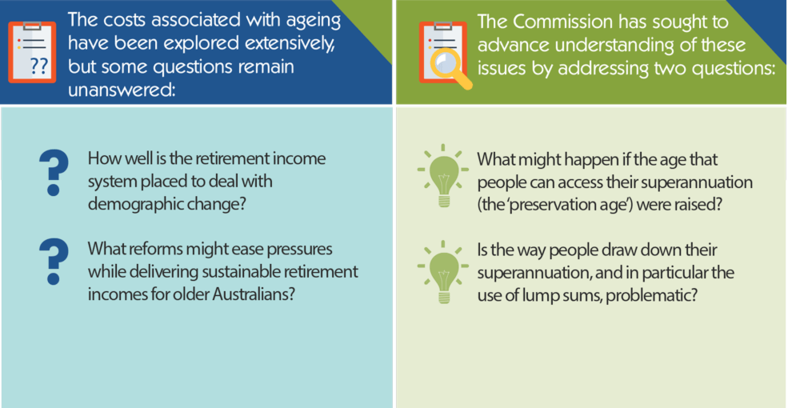 As part of its research on Superannuation Policy for Post Retirement the Commission has developed a model - referred to as the Productivity Commission Retirement Model (PCRM) - to assess the effects of increasing the preservation age. The PCRM can be described as a 'behavioural microsimulation' model. Behavioural microsimulation models seek to simulate individual or household level decisions, and are commonly used within an economic framework to assess the impact of policy changes (such as changes in tax and benefits) on governments' fiscal positions and on labour supply. They are particularly useful where there is a wide variety of decision makers, and where complex policy changes are likely to impact these different decision makers in different ways. A research report by the Productivity Commission. People are living longer and the share of the elderly is increasing. Coming decades will see this trend continue. How well is the retirement income system placed to deal with demographic change? What reforms might ease pressures while delivering sustainable retirement incomes for older Australians? What might happen if the age that people can access their superannuation (the 'preservation age') were raised? Is the way people draw down their superannuation, and in particular the use of lump sums, problematic? Along with the Age Pension age, the preservation age is considered to be an important policy lever as we transition to an older Australia. The preservation age is cureently 55 and is being raised to 60, it provides both a financial incentive and a signal that can influence some people's decision to retire. The Age Pension age is currently 65 and is being increased to 67. 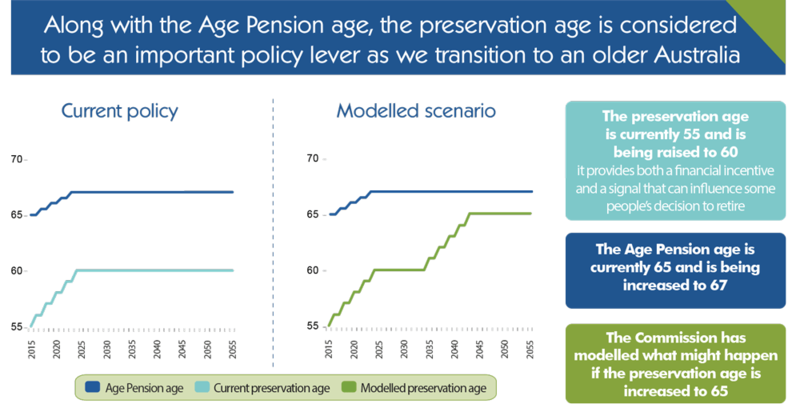 The Commission has modelled what might happen if the preservation age is increased to 65. What if access to superannuation were delayed until 65 years? Older worker participation would increase by 2 percentage points. Those who delay their retirement would remain in the labour force for 2 years longer on average... and their superannuation balances would be 10% larger at retirement. 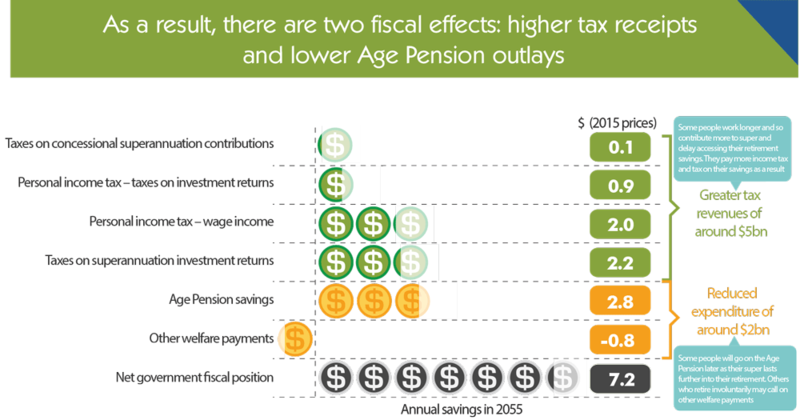 As a result, there are two fiscal effects: higher tax receipts and lower Age Pension outlays. 0.1 Greater tax revenues of around $5bn. Some people work longer and so contribute more to super and delay accessing their retirement savings. They pay more income tax and tax on their savings as a result. 2.8 Reduced expenditure of around $2bn. Some people will go on the Age Pension later as their super lasts further into their retirement. Others who retire involuntarily may call on other welfare payments. 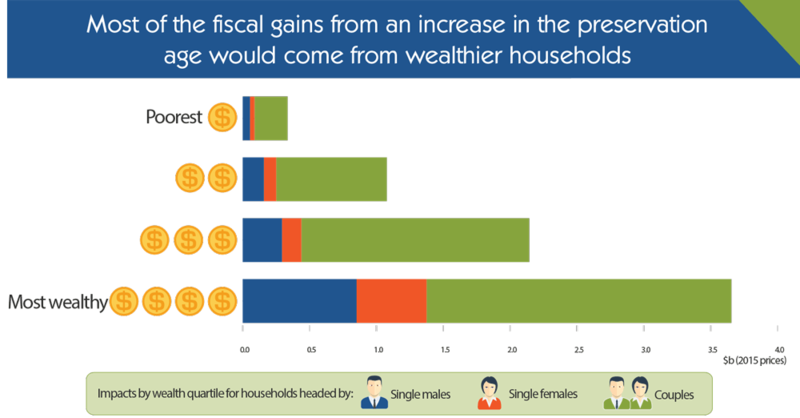 Most of the fiscal gains from an increase in the preservation age would come from wealthier households. This reflects the variety of people's circumstances. Not everyone has a lot in super savings. In 2011-12, 10% aged 44-54 had more than $230,000 of superannuation and 15% aged 44-54 had no superannuation. 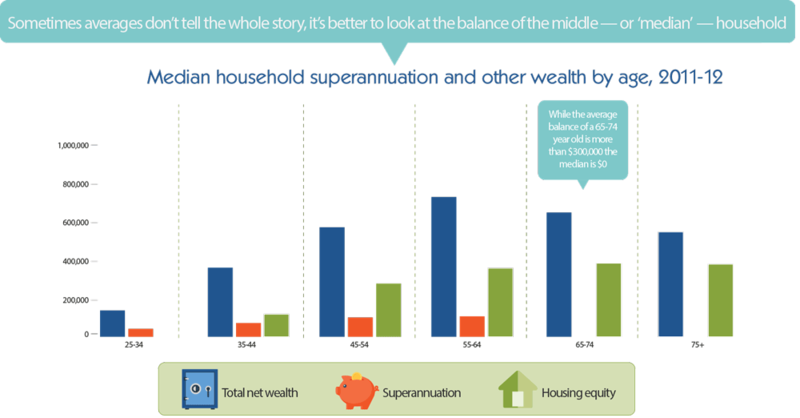 Sometimes averages don't tell the whole story, it's better to look at the balance of the middle - or 'median' - household. While the average balance of a 65-74 year old is more than $300,000 the median is $0. Not everyone chooses when they retire. Of those who retire between 60-64 years, almost one-half of men and over one-third of women retire involuntary. Is the way people draw down their superannuation problematic? Some argue that people exhaust their superannuation too quickly by taking lump sums at retirement - there have been calls to restrict lump sums. Note: the above do not sum to 100% as undecided/don't know/other are excluded. 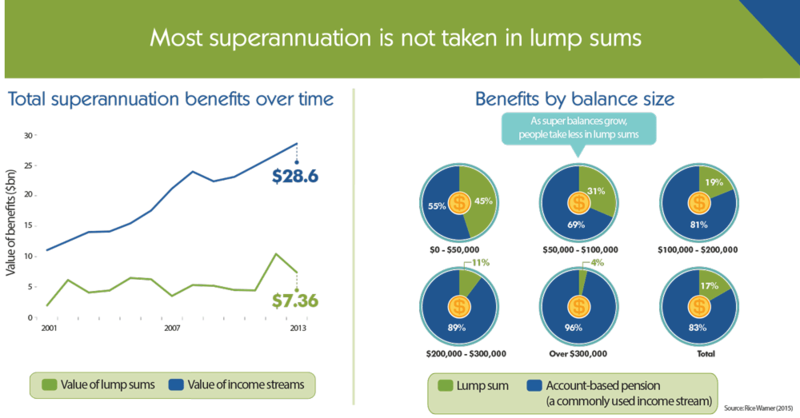 As super balances grow, people take less in lump sums. The retirement income system has been subject to ongoing piecemeal change. But its objectives remain poorly defined. If the preservation age were raised to 65, some people would work longer, have more savings for their retirement and there would be fiscal gains, largely coming from wealthier households. But important implementation issues would need to be considered, including a safety net for those who retire involuntarily. Lump sum use does not appear problematic. Changes to the retirement income system need to cater for the diverse circumstances of retirees as 'one size' does not fit all. Ideally, before any further changes are made, the system needs to be considered as a whole with a common set of objectives in mind.